Dunkin takes to the dance floor at his campaign’s Bingo Bash, celebrating his own 50th birthday. 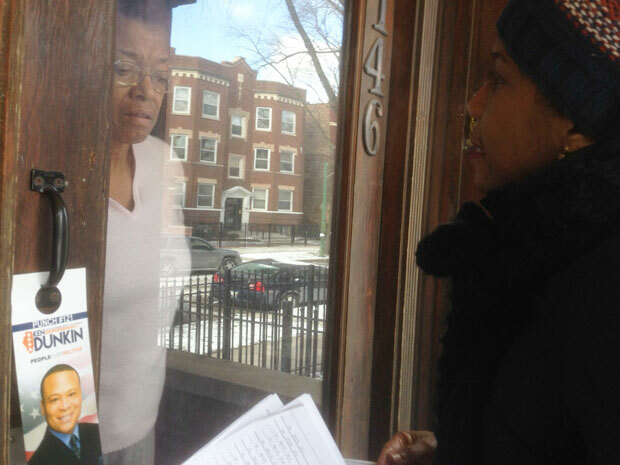 Challenger Juliana Stratton makes her pitch to a voter. The Democratic primary race in a single Illinois state representative district has become a $2 million battleground. The few thousand voters there could swing the balance of power between Republican Gov. Bruce Rauner and the Democrats who control the legislature. Rauner’s allies are behind incumbent Rep. Ken Dunkin, who broke with other Democrats last year. Unions are backing his opponent, Juliana Stratton. I met up with both candidates in the district, to see them interact with voters directly. Stratton says she has been canvassing the district— going door to door— since late last year. At first it was after work, and then after New Year’s, she went on leave from her job at the University of Illinois. At least, that’s what she says. And she does seem very, very practiced. STRATTON: Nice to meet you, Ms. Thompson. You received my information? Stratton gives her spiel—Dunkin missed some key votes, aligned himself with Rauner, hurt kids and seniors. It takes 30 seconds. Then Stratton asks directly for Thompson’s support. “I was going to vote for you anyway,” Thompson says. In the 30 seconds that follow, Stratton thanks Ms. Thompson, and makes a series of asks: Would Thompson pass word to other voters in the house? May the campaign put up a small sign in front of the house? How is Thompson herself is doing? Stratton is leaving when Thompson’s adult daughter arrives. She’s also a registered voter, so Stratton lingers 60 more seconds. “You’ll be hearing from me,” she says. Having made her goodbyes at this house, Stratton moves on. Sixty seconds later, she is knocking on the next door. While I’m with her, she hits about 35 doors, and talks with about 18 voters. All but three or four tell her “yes.” The rest are maybes. After a couple hours I get ready to leave. Stratton smiles, gives me a 30-second farewell, and keeps moving. A couple days later, I arrive promptly at 1 p.m. at Harris Park, at 62nd and Drexel to meet Rep. Dunkin. His campaign has told me the candidate can spare me 10 minutes. Dunkin isn’t there when I arrive, but I’m not alone. Hundreds of senior citizens are getting checked in and shown to tables in the gym. A DJ plays 1960s-era soul over the P.A. This is a Bingo Bash, with free transportation, a catered lunch from Chicken and Waffles, raffles, and, I’m told, $2,000 in prize money. When Dunkin arrives, about a half-hour later, the music cuts out. While volunteers start bringing out food, the DJ brings the music back, and Dunkin hits a small dance floor to celebrate his 50th birthday. Some of the ladies join him—he’s a great dancer—and the people around him are having fun. After he’s made his rounds, when I get him alone, I ask him about the fact that his major contributors are groups that support parts of the Republican governor’s agenda. Dunkin says this is the kind of thing that happens all the time: a new source of money entering the state’s political system. I ask how the presence of this new money might have influenced him. If it hadn’t been there, would he still have skipped key votes, denying House Speaker Mike Madigan some big victories over Gov. Rauner? “I didn’t factor that into it,” Dunkin says. I press him on this a few times. He says he’s just trying to be a good public servant. Things aren’t always what they seem. He says he’s got the support of his voters. Like today’s party. He says what’s interesting is how quickly unions turned on him after he voted with them for years. I ask if he could honestly be surprised by that. I ask again: Could he possibly be surprised? Interview. Over. One of Dunkin’s people takes me by the arm and pulls me away (To be fair, I’ve taken more than the 10 minutes they promised). Back in the gym, the raffle is about to start, and bingo cards have been passed out. Gray, the woman who thought Dunkin didn’t recognize her, says bingo is the only reason she came out. She says she’s met Dunkin numerous times. Later I find out she’s a block club president. I want to stay to hear how some other party-goers felt and see who won the raffle and bingo money, but that doesn’t work out. As Dunkin is about to read off the first winning raffle number, he spots me and my microphone.